A man armed with a hammer threatened staff at an hotel at a Belfast hotel this morning, it has emerged. Detectives are appealing for information after a report of an attempted armed robbery at a the hotel in the University Street area of Belfast. Detective Constable McIlwaine said: “At around 3:45am, it was reported that a male entered the premises armed with a hammer. He threatened a male member of staff during the incident. "The man made off from the scene empty handed towards the Ormeau Road area. The member of staff was not injured during the incident." 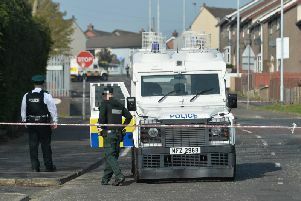 A PSNI spokesman said the armed man had been wearing a red raincoat, blue jeans and a dark baseball cap. "He was also wearing a multi-coloured scarf around his face during the incident," he added.